New arrangements of 14 Filipino compositions . 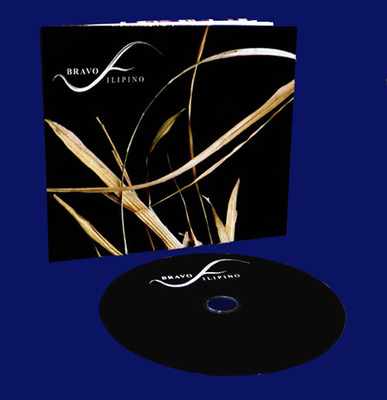 The music cd is part of the Bravo! Filipino 2008 project of the Ayala Group of Companies.
" Instrumental Arrangements of Filipino Songs. It is next to impossible to imagine our lives without music. For centuries, music has been integral to Philippine culture as an expression of our triumphs and tribulations. Music brings us together, breathing life into our history and our notion of what it means to be Filipino. The Bravo Filipino festival pays tribute to the prodigious and internationally recognized musical talent of the Filipino, and this landmark collection celebrates the ingenuity reflected in our musical heritage. Representative of the genres comprising our music tradition, indigenous, classical, folk, and modern, these songs are a soundtrack of Filipino life. This collection cuts across time and space; from the precolonial to the present, from one region to the next. These fresh renditions by some of our country's finest musicians aim to highlight the dynamic nature of Original Pilipino Music, and to beautifully blend the best of the past and the best of the present. We will recognize some of these pieces and yet find them new. We will discover pieces we've never heard before and come to know ourselves better. When we are invited to listen to the songs with our bodies, hearts and imagination, we are actually being invited to take joy in these songs, to discover the common threads among the musical genres, to revel in how these have influenced each other over the years and shaped our music into what it is today. As we listen, we are reminded that we have a genuine musical heritage we can be proud of, something uniquely Filipino, something that sings to us and speaks for us"